In six days, SIX DAYS! we will be dropping off four of our five children at our parish school for their first day. That’s right! From 8:00 until 3:15, our offspring will be in the loving care of teachers, administrators, and volunteers for whom I am so very, VERY grateful. At this time of year, I can’t help but go back in my mind to the two weeks leading up to the first day of school when I was a young woman teaching fifth graders. I would organize my classroom, create beautiful bulletin boards, and lay out detailed plans for our first week together as a class. I put so much effort into preparing so that the first impression my students got was that I cared and that I had lovingly prepared a place for them. 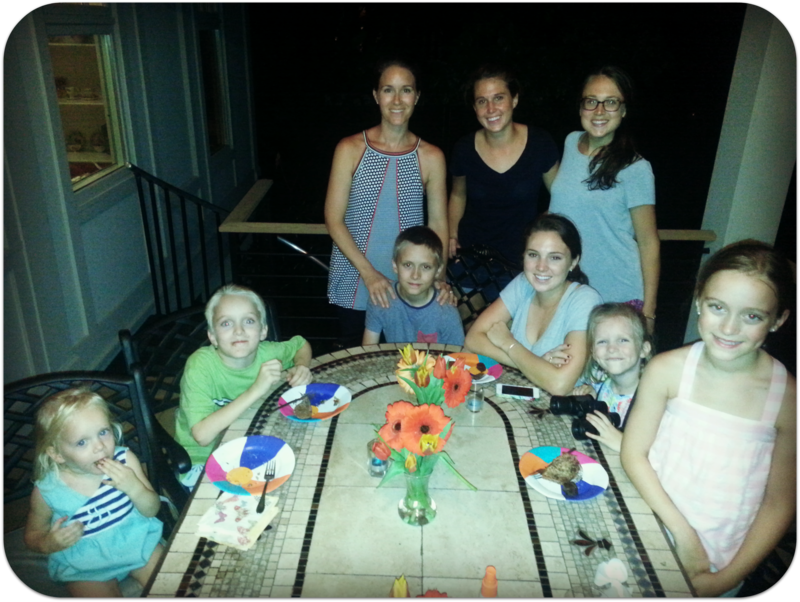 Just last week, I had the pleasure of spending an evening with three of my former students, all sisters, and their mom. They are all young ladies now, two professionals and one pursuing her doctorate. We reminisced about my years with these three beauties. 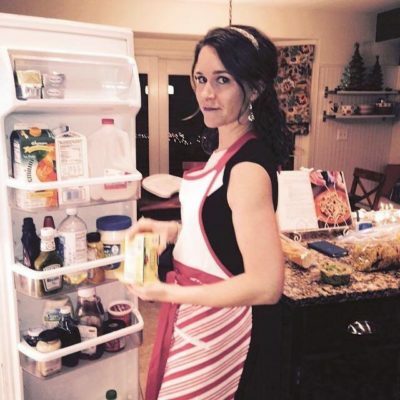 When I taught the oldest sister, The Hubs and I had just started dating. Then at the end of the second sister’s school year, we got married. And when the third sister was in my class, I was pregnant with Smarty Pants. I apologized to the girls and their mom, feeling so guilty for all the silly homework assignments I gave them. The parents of my students earned some serious time off from Purgatory, no doubt! The take away for the evening for me was this: These little souls we are forming, sending off to our parish school each day, are going to be okay. 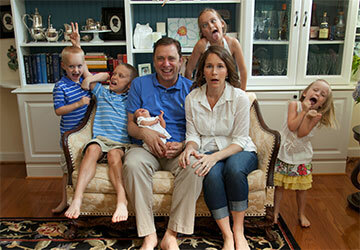 I know for a fact that the lovely ladies pictured above were raised in a home centered on Christ. They prayed the rosary on their drive to school each day, and they were devoted to the sacraments as a family. So are we. Their mom made it a priority to expose them to spiritual experiences, always leading by example in her devotion to the Blessed Sacrament and Our Lady. Regular visits to the Poor Clares to pray and leave donations, doing holy hours, and attending daily Mass when possible — these were all part of the fabric of their upbringing. Whatever was lacking in the school or the teachers or friends didn’t matter because their home life was so centered on what’s important. And that’s what we’re striving for too. 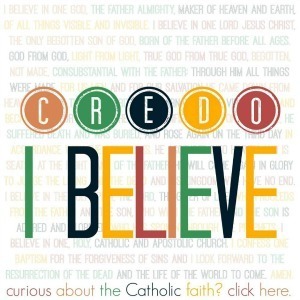 We want our children to consider our beautiful faith to be of utmost importance. And if we’re not upholding that here at home, it won’t matter what’s being said at school. That said, having four children in our catholic school is not always easy. It’s a full time job, really. One day I’m all, “I love our parish school! Thank God for these wonderful teachers!” and a few months into the school year I start to feel bogged down by the day in, day out demands of having so many children in school. It’s great to see the beauty in catholic education, but sometimes you can lose sight of the ideals and get lost in the details. So, I thought it might be helpful to share with you some of the practical things I do in our home and with our children to keep things running smoothly when it comes to all things school related. Let’s start with something simple: UNIFORMS! Oh school uniforms, I wore you for twelve years of my life and you know, I never minded you. I liked not having to worry about what I was going to wear five days a week from September to June. It was very freeing for me. And so far, our kids have never complained about uniforms either. When they’re in Kindergarten, they complain a bit, but I think that’s just because it’s an adjustment for them. Once they realize that the entire school wears them everyday too, they tow the line. Our school happens to be pretty formal when it comes to the uniforms. From the time they are in Kindergarten, the boys wear dress pants, black leather shoes, a black leather belt, a shirt and tie, as well as a sweater (in the cooler months). The girls wear the usual jumper with a Peter Pan collar blouse, knee socks, and black flats. No makeup, simple jewelry, and no one goes crazy with hair accessories. When the boys are in Middle School, they wear real ties that they have to tie themselves and sport coats. The girls wear skirts and blouses with a sweater. In general, the students look put together and neat, and I think that the formality of the uniforms is good. I know there are studies that have been done about the effects school aged children’s clothing has on their ability to focus and learn. Who knows. I just like how adorable and scholastic they all look. 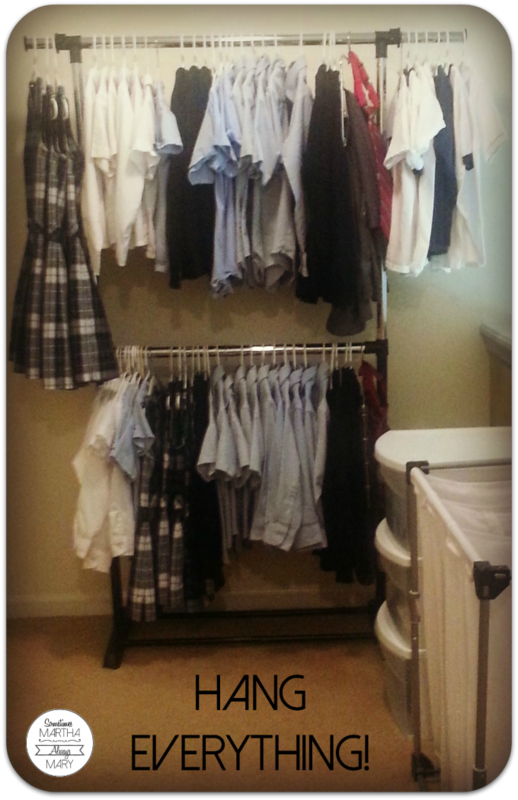 It goes without saying that we have accumulated quite a few school uniforms over the years. From new purchases from Flynn & O’Hara and the used uniform sale to things I’ve scored from friends who’ve moved or changed schools, we have everything we need and then some. The problem over the years has always been the morning scramble. I’m sorry, but I cannot stand the sound of a child’s voice proclaiming, “Maaaaah-um! I don’t have any ties/socks/blouses!” or “Mom! Where is my belt? !” It makes me wanna pour some Bailey’s into my morning cuppa. So, this year, with four kids in uniforms, we are trying something new. I’m calling it: Uniform Central. It’s funny how something as little as a pair of socks can cause so much upheaval in our home. Oh, the tears that have been shed over not having the correct white socks for PE day! So, this year, we’re keeping a sock drawer stocked with white socks for PE and black socks for regular uniform days, one for the boys and one for the girls. I’m not too concerned about sock sizes. They’ll figure it out on their own. When we’re sorting clean laundry, it will be a big time saver to just toss all the boys’ socks in one bin and all the girls’ socks in another bin. 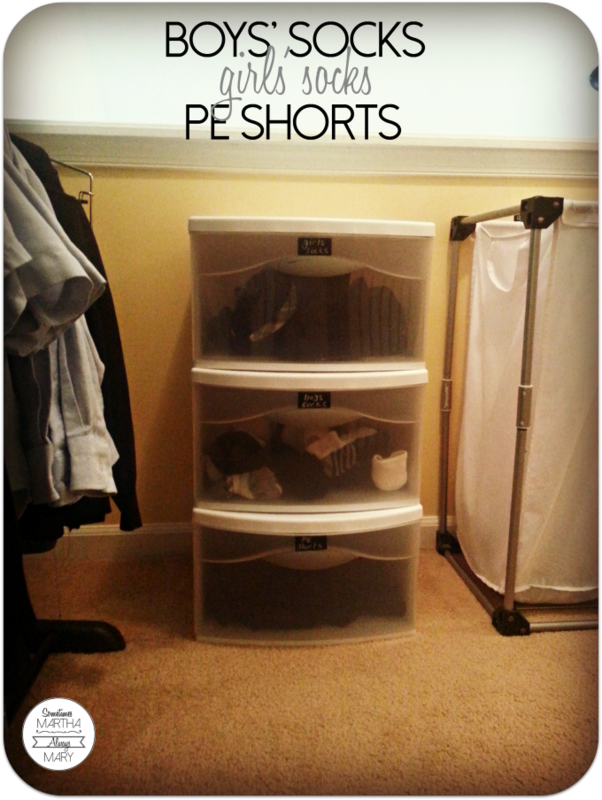 PE shorts go in the third drawer. Again, they’ll figure out what size is best for them, and I don’t have to sort them by size. 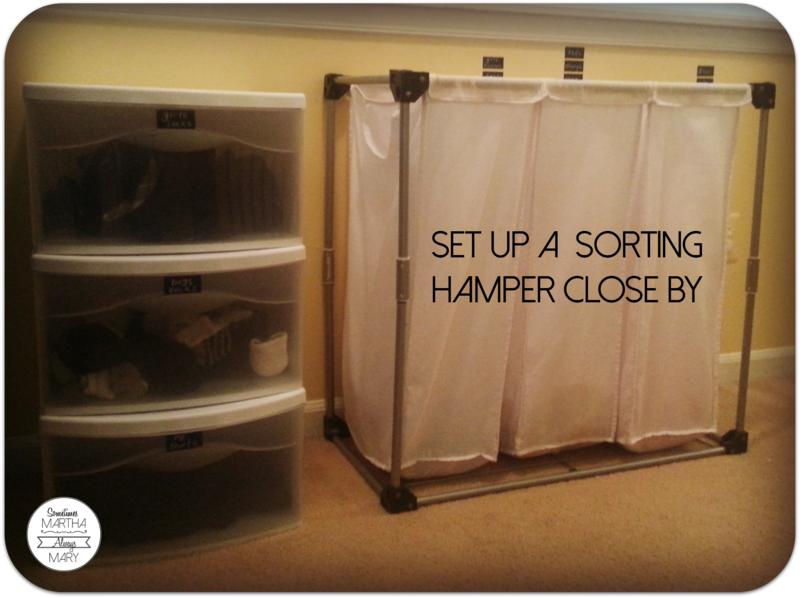 Major laundry day time saver! So as you can see, I hang all shirts, jumpers, pants, and sweaters on hangers. 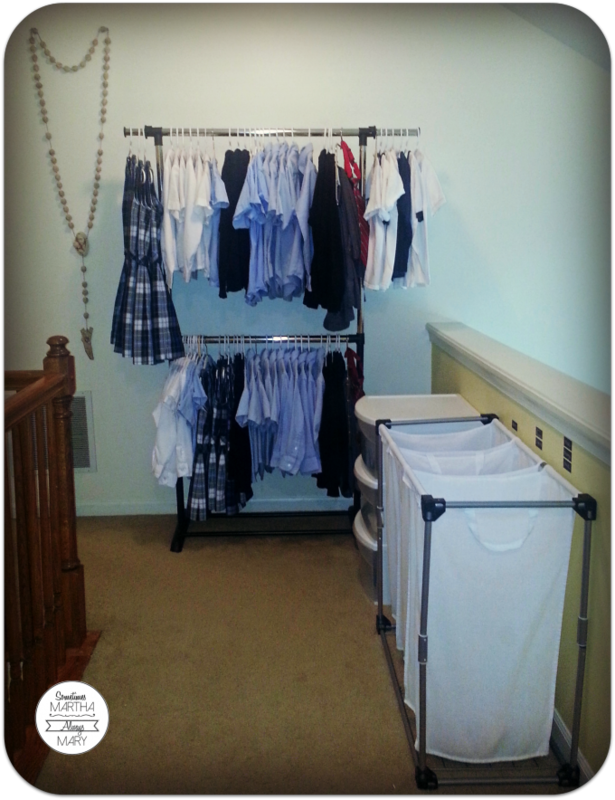 On laundry day, when the clothes have just finished drying, they go straight on a hanger. We have way too many uniform shirts on the rod right now, but as the year progresses, we will put some in storage or add them to the used uniform closet at school. Don’t ask me how we ended up with so many shirts! I have had this hamper up in the hallway for years now. I have a label for each section on the wall: darks, lights, reds/pinks/oranges. I am planning on adding another single hamper just for uniforms. The girls put their white blouses in the lights bin, but all other uniform components get washed together. This keeps life simple for me on laundry day. My hope is that on school mornings, the children will wake up, make their beds, then come out to the hallway and grab everything they need for the day, get dressed in their rooms, and come downstairs for breakfast. This year we’re going to have a set of toothbrushes in the powder room on the main floor so they don’t have to go back upstairs to brush their teeth before they leave. And I think I’ll put a bin on top of the uniform drawers for hangers, otherwise they will all end up on the floor. I hope you’ve found these ideas helpful! I’ll update you once the school year gets underway. We’ll see if my uniform organization approach works in real life! I’m hopeful. Great ideas! 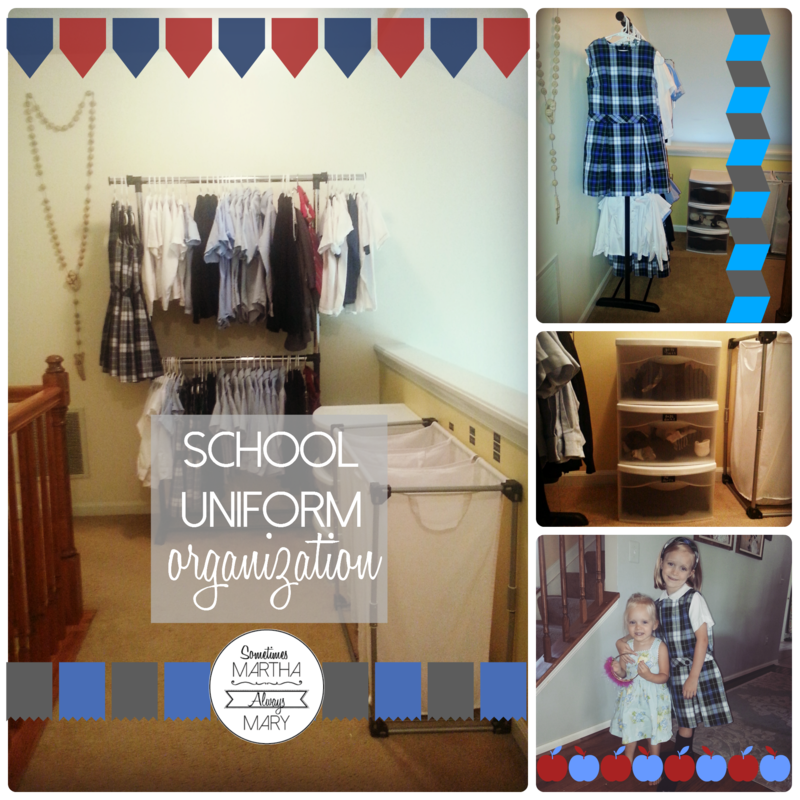 That uniform organization system is brilliant!